MANKIN, Helen Douglas, a Representative from Georgia; born in Atlanta, Fulton County, Ga., on September 11, 1896; attended public and private schools; A.B., Rockford College, Rockford, Ill., 1917; LL.B., Atlanta Law School, Atlanta, Ga., 1920; lawyer, private practice; during the First World War was an ambulance driver in a unit attached to the French Army in 1918 and 1919; member of the general assembly of Georgia, 1937-1946; elected as a Democrat to the Seventy-ninth Congress, by special election, to fill the vacancy caused by the resignation of United States Representative Robert Ramspeck (February 12, 1946-January 3, 1947); unsuccessful candidate for renomination to the Eightieth Congress in 1946; unsuccessful write-in candidate to the general election for the Eightieth Congress; died on July 25, 1956, in Atlanta, Ga.; remains were cremated. 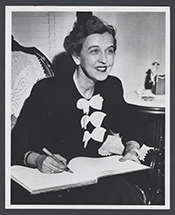 Helen Douglas Mankin in Women in Congress, 1917-2006. Prepared under the direction of the Committee on House Administration by the Office of History & Preservation, U.S. House of Representatives. Washington: Government Printing Office, 2006.